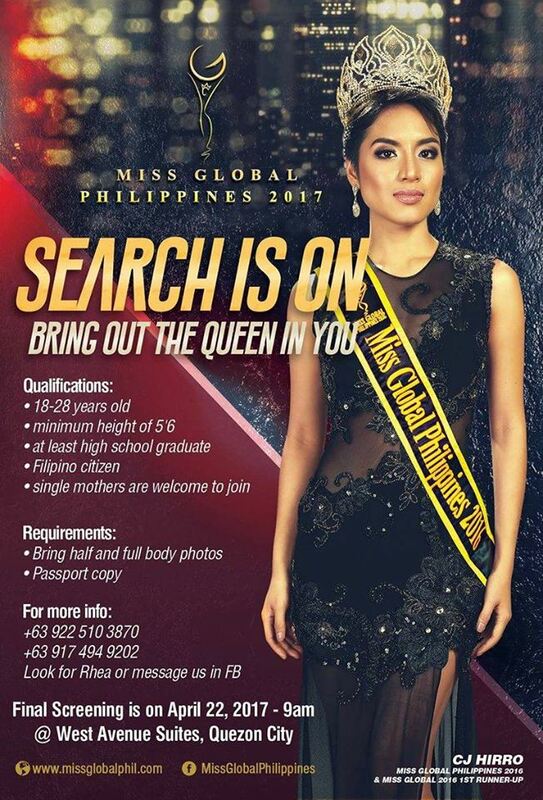 Home Miss Global Miss Global Philippines 2017 : Search is on! Miss Global Philippines 2017 : Search is on! Final Screening for Miss Global Philippines 2017 is on APRIL 22, 2017 (SATURDAY). Please be there at 9am for preparation. Venue: 3rd floor West Ave. Suites, Quezon City. Miss Global Philippines pageant is a search for deserving Filipino women who will serve as a Tourism Ambassador promoting Philippine heritage and its world-class destinations here and abroad. Camille Jensen "CJ" Hirro is the reigning Miss Global Philippines 2016.